Would you like to spend summer on a peaceful lake, in the pristine wilderness of Finland? 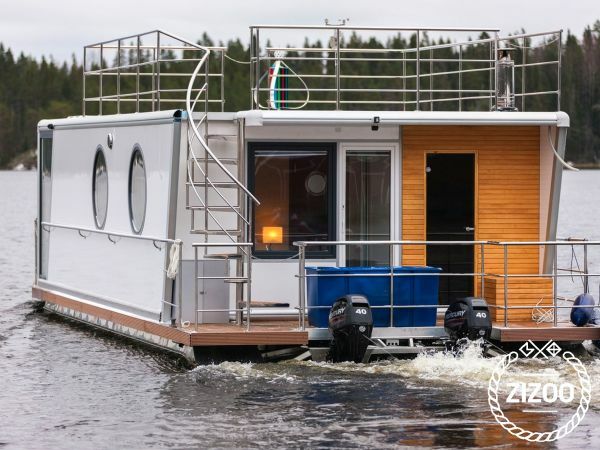 On a Houseboat you can easily get to great fishing spots, beaches or discover different Finnish villages and towns . You can sunbath on the roof, make food in the kitchen and take a rest in two bedrooms. A summer day is great for a little a Kayak excursion on the lake, mountain-biking along shoreline trails, or inflating an air-slide for the children on a sandy beach. Our houseboats are easy to navigate. You do not need special boating skills or licences; we will instruct you on how to use the boat prior to departure. Houseboats are also equipped with a Chartplotter to make it easy to navigate the Finnish lakes.